Green Dot is a violence prevention program that focuses on making our campus safer by empowering bystanders to become active members in reducing power-based personal violence (sexual assault, domestic or dating/intimate partner violence, and stalking). A green dot is simply your individual choice at any given moment to make your community safer. A green dot is any behavior, choice, word, or attitude that promotes safety and communicates intolerance for any form of violence. 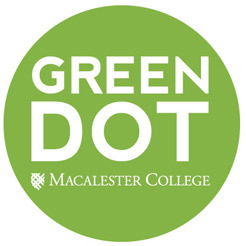 Macalester College hosts multiple free Green Dot Bystander Intervention Trainings on campus for students every year. To learn more or to sign up for a training opportunity during the 2018-2019 academic year, visit the web page on Bystander Trainings.